Tom Perry, from the Des Moines Register, wrote about our Killer Sandwiches. The article was in the February 9, 2011’s edition of the Datebook. Food: The star of the show here is famous. Dad’s Killer Sandwich has a devout following. Made up of roast beef, turkey breast, smoked ham, corned beef, pepper cheese, Swiss cheese, American cheese, lettuce, tomatoes, kosher pickles, mustard, Miracle Whip, Tuscan Italian dressing on an Italian hoagie roll ($5.99), it rivals just about anything the national chain sub outlets crank out. For a change of pace, we got a meatball and cheese sandwich ($4.99) that was kicked up with banana peppers. Because the potato and macaroni salads looked tasty we had a tough time with sides, but ended up going with the macaroni for $2. Des Moines Juice Magazine Loves our Killer Deli! 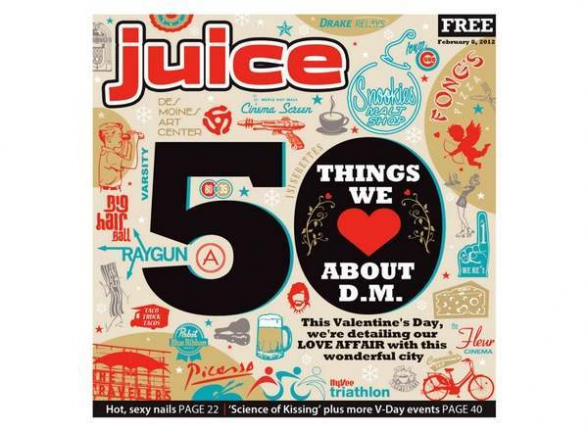 With Valentine’s fastly approaching, Juice Magazine wrote an article about 50 things they love about Des Moines. 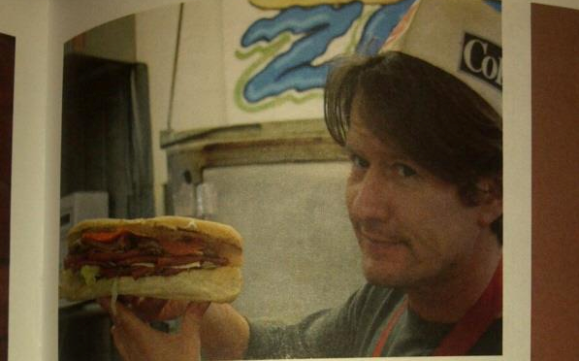 – “A Des Moines love affair: 50 things we love” They included our Dad’s Killer and the locals love for our Killer Deli to the list! The “killer” deli at B&B Grocery, Meat & Deli. This hidden (to many) gem south of downtown features a giant menu that barely fits the myriad food options at your disposal. Then there’s the Dad’s Killer monstrosity of a sandwich, containing roast beef, turkey, ham, corned beef, a trio of cheeses, some veggies and condiments on a hoagie roll so packed you can almost hear it beg for mercy. 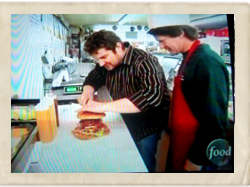 WHO’s news team came by B&B Grocery, Meat & Deli to watch John Jr, third generation family butcher, butcher carcass beef. The segment is highlighted in WHO’s Agribusiness report for February 3, 2012. Here’s the afternoon report that starts right off with the B&B Newscast. 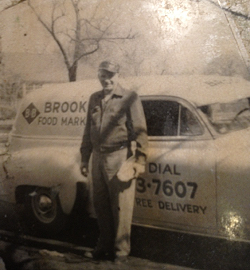 We still butcher beef the way our grandfather, and father did when they ran our family store. In fact, we can custom cut steaks (and pork) the way you want them cut! You can also order a half of beef, front or hind quarter of beef, or one of our thrifty meat orders. Stop by or call us at 515-243-7607 to get your beef or pork butchered the old fasioned way! 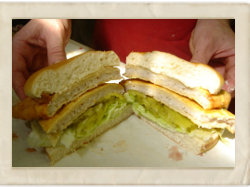 Our Dad’s Killer Sandwich was recently highlighted on the Planker Sandwiches Presents Traveling Sandwiches blog. Planker Sandwiches is a sandwich shop in Bend, Oregon. Even though presidential elections are way off in the distance the Iowa caucuses have been coming up a lot in the news lately. In honor of this important event we are bringing you this delicious sandwich from Des Moines, Iowa. You can find this killer sandwich at B & B Grocery. Michael Stern from Roadfood.com added B&B Grocery, Meat & Deli to their listing of restaurants. 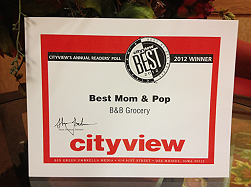 Although it is a sideline at B&B, which primarily is a grocery store, meal service is not to be missed. It’s a do-it-yourself affair: step up to the butcher counter and order what you’d like to eat, from breakfast burritos to heroic “killer sandwiches” to the Quadzilla (4 burger patties et. al. on one bun) to the piece de resistance, an Iowa tenderloin. The tenderloin is what we would call Des Moines-style, meaning that it is fairly thin and ridiculously wide, so wide that many customers fold it over once or twice inside the bun so the sandwich can actually be picked up. Still, that ribbon of pork inside crunchy crust is juicy and sweet. 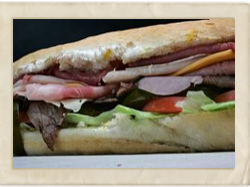 Click here to read Michael’s complete review about our Killer Sandwiches! While your there, go ahead and add your review! 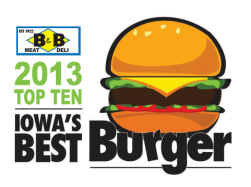 B&B Grocery, Meat & Deli along with our Killer Sandwiches were mentioned in Edible Iowa’s magazine. the new-to-us-but-not-to-Des Moines B&B Deli, where you’ll find some of the friendliest service anywhere and a HUGE selection of what they quite deservedly call “Killer Sandwiches.” Seriously, get one toasted. They’re made of awesome. Read more at Edible Iowa. Joe Lawler, from Metromix, found 3 Italian beef sandwiches in Des Moines and our Killer Italian Beef Sandwich was one. 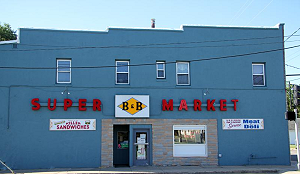 Dining at B&B Grocery, Meat & Deli is not for the faint of heart. If the excessive colors, exclamation points and blown-up photos on B&B’s “Killer Menu” don’t intimidate you enough, the list of 50-plus sandwiches and burgers and 21 sides should do the trick. To make matters more daunting for first-timers like me, nearly all the sandwiches cost less than $5. 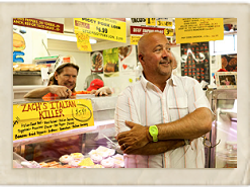 David Hammond, also known as the Food Detective is a food write for the Chicago Sun Times. He is also found and contributor of a culinary chat site LTHForum.com. He recently wrote an article about various food challenges in Des Moines titled, “Food Detective: Trying to stomach macho meals“. B&B Grocery, Meat & Deli’s Killossal Sandwich was included in the article. At B&B Grocery, Meat & Deli, they boast a whole line of “Killers.” There’s Zach’s and Dad’s Killers (both sub-type sandwiches), Quadzilla (four hamburgers) and one giant pork tenderloin (I had this one: excellent). Put them all together and you have the Killossal, a novelty sandwich inaugurated the day we visited B&B. It was barely finished by a family of five. First, I was surprised that it was as close to downtown as it is. I would have thought that I would have noticed the place driving down 9th Avenue. Second, I was surprised by the crowd. I have just come to expect that crowds only appear at fast-food places these days. Not only was the place absolutely packed, but other than some Lincoln High students the place was populated with “working men.” Many of them were wearing the different uniforms of their various trades. It almost reminded of a bowling alley on competition night. on the Local Restaurant Scene"